Vital Statistics, Demographics, Restaurants and Food. Welcome to Health Map Online! Improve emergency preparedness through better access to current health and facilities information. Support public health and well-being through access to integrated information that can improve health. Integrate mapping applications with other information to improve logistical decisions and to allow for better physical access to goods and services that enhance health. You can find more information about the Health Map Online project in the About and Acknowledgements pages. To access another Health Map Online region, click on the 'Regions' button in the sidebar and select the region you wish to visit. We have placed all of the HMO data in a map for ease of use. Follow the link to see the data and visualize it how you like. 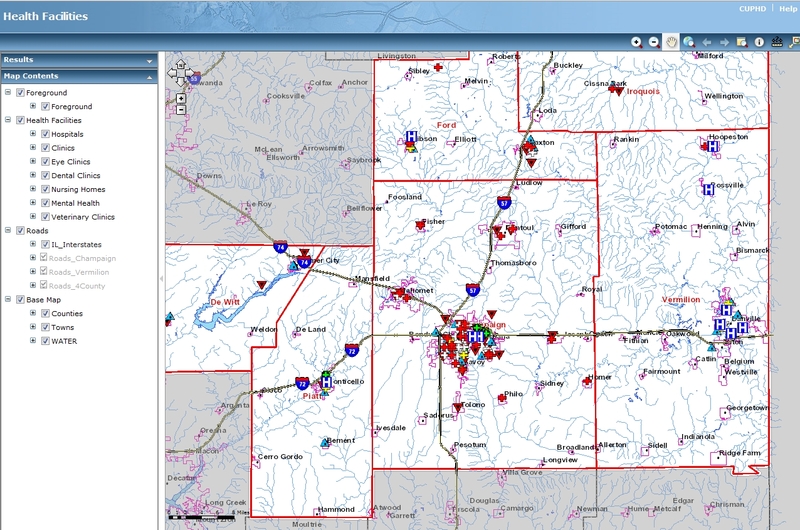 To go along with the map, here is a tutorial for using ArcGIS Explorer Online. 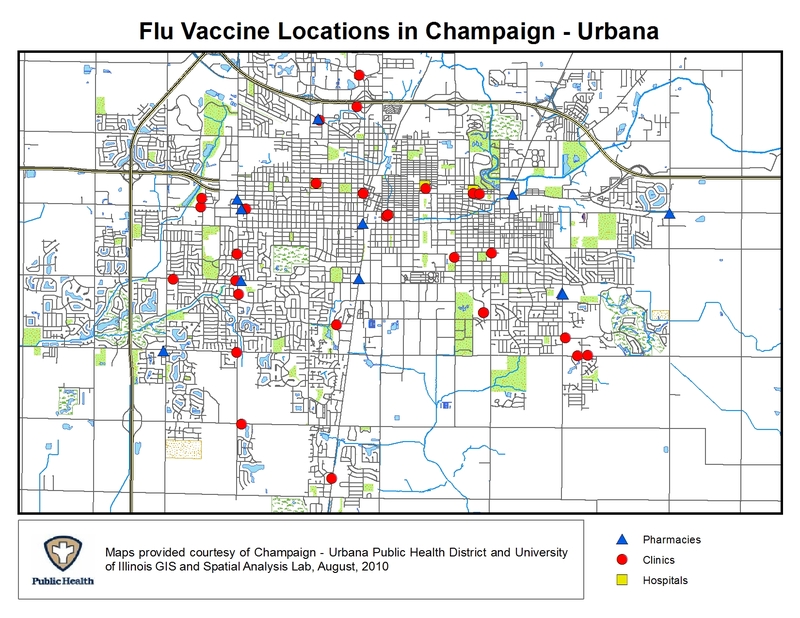 We have created a map to show people where to find the seasonal flu vaccine in the Champaign-Urbana area. In addition to the map, here is list which includes the address of each location. We have used the 2010 Census data to map demographic information of special interest to public health. Take a look at the maps by clicking on the image to the left. 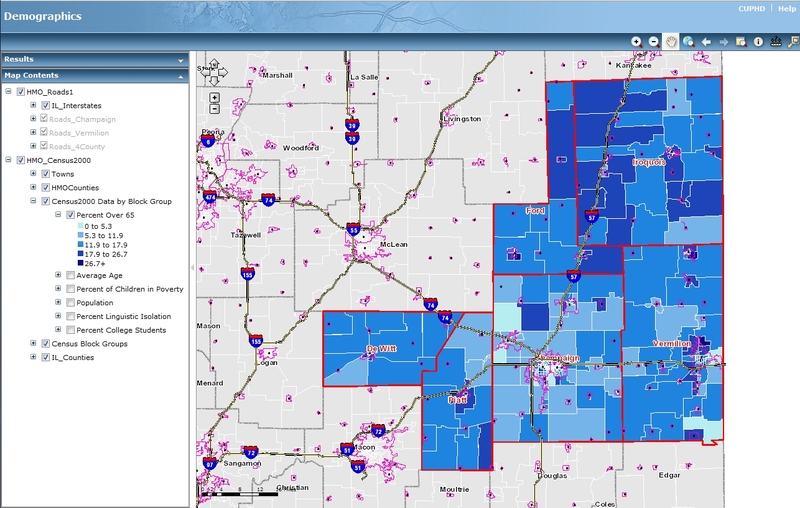 We have mapped the locations of all categories of health facilities in the East-Central Illinois region. Follow the link (in the image to the left) to an interactive map of all of the health facilities in the region. During the 2009 H1N1 pandemic, CUPHD used geographic information systems mapping to better target areas where vaccination rates from CUPHD's vaccination distrubtion campaign were low. In particular we targeted places with low income and vulnerable populations and parts of the community where other providers may not have reached. Copyright © 2002-2011 Champaign-Urbana Public Health District, all rights reserved.